Somewhere in Waitomo, New Zealand. Taken during my weekend trip to Waitomo. Light was quite unusual that day. Very light low clouds created soft shadows without blocking much light. From time to time sum was poking through the clouds creating spots of soft, directional light. I'm keen to hear Your thoughts on sky. I decided to leave it very bright as it felt that bringing details or lowering exposure was making image top heavy. I love the exposure and the light on the trees and hillside. You might play with a slight grad filter in post to bring out more details in your sky and separation in the clouds. 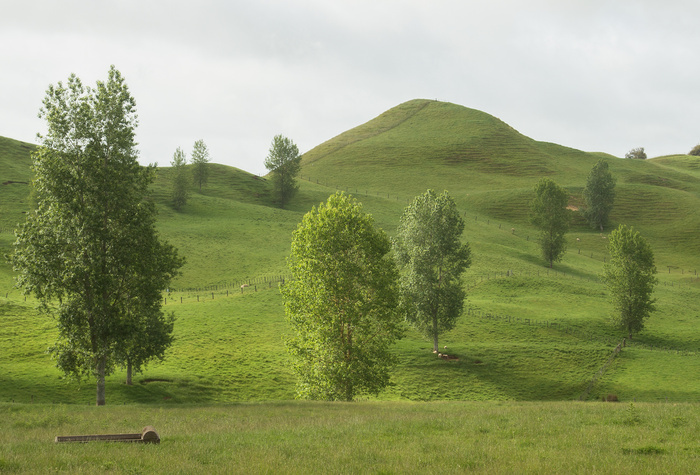 I would maybe do some slight dodging and burning on the grass, near the trees and to highlight the undulation of the hills. It would help guide the eye throughout the image. I have to ask what’s the wooden item in the foreground? Very beautiful thank you for sharing. Thanks Joel. I did a bit of burning to accentuate shadows on hills. After not looking at the picture for a while I also think some dodging might work well here. I don't know what is the wooden item. I suspect it might be some kind of container for a water for sheep.